I recently finished the purse I was making for my grand-daughter, so thought I would give you a peek. This time I knitted the honeycomb stitch in two colors. You can see the blue peeking out from underneath the black. 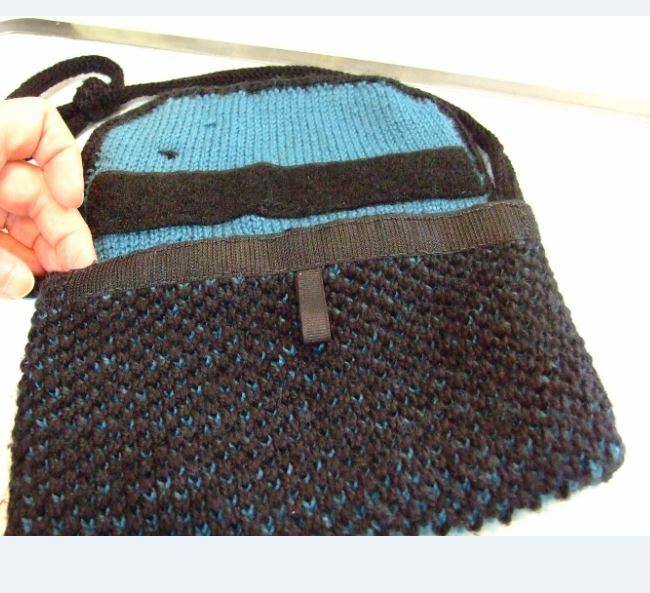 This project was accomplished with a double knit for the body, with the flap knitted in the round. To keep the gauge equal while knitting the flap, I knitted in the round only on the knit rows. I will demonstrate how this is done, when I complete the pattern. Below you can see the smooth result of this method. You will notice that I used an I-cord to complete the flap edge. To keep it from stretching, I ran a piece of satin cord through the opening. It worked great. 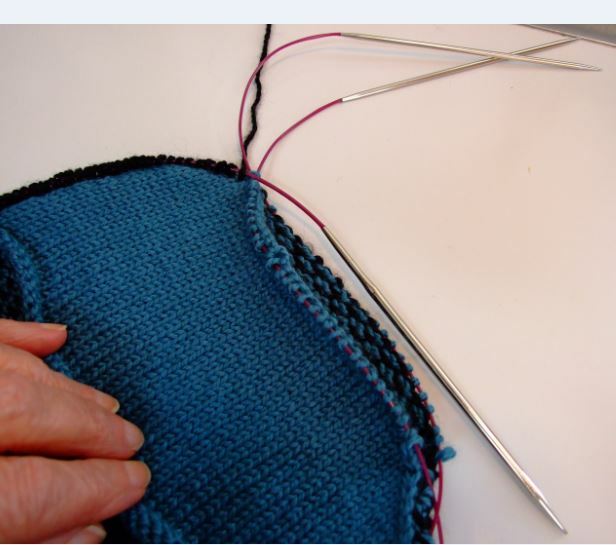 One thing that I have come a conclusion about is that you need to firm up the top of the purse edge with a traditional, non-stretchy bind off. 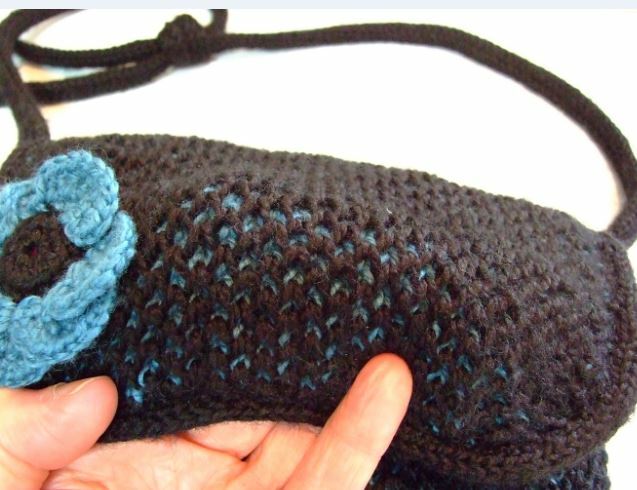 Next time I make the purse, I will bind off the lining stitches, then pick up new stitch in the bound off edge before proceeding with the flap. This will insure that my flap will retain it’s shape, especially since the outer edge will be kept in tow with the I-cord. Below is a photo of the closure. No button to stretch, just a tab of ribbon to pull it open. 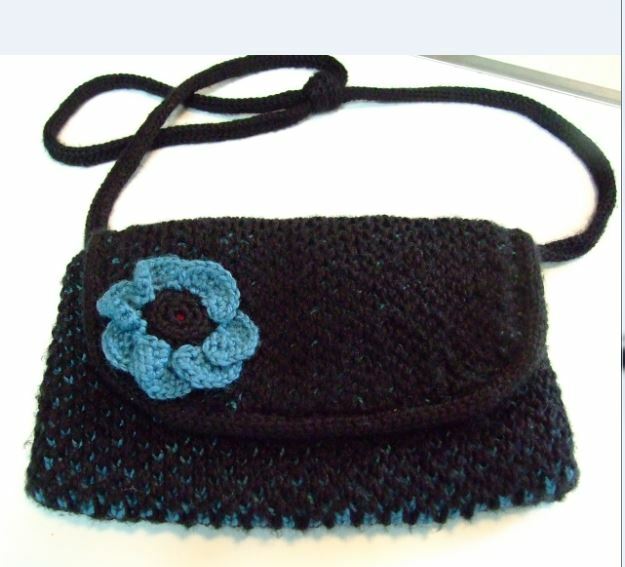 You will notice that the corresponding Velcro is about 1/2 inch above the top edge of the purse. I find that this assures that the closure doesn’t have to be exact to be secure-especially for a 9 year old. The tab of ribbon aids in opening the purse. I love the two-tone version. I think it would be really attractive if you used a variegated jeweled tone under neath, perhaps even one with a bit of sparkle. Hummmm?????? ?